Every construction job site has an obligation to safety, and all contractors take it seriously. Despite this obligation, awareness and performance of safety erodes across the industry from time to time; even the most robust systems and protections fall victim to behavior, which is the cause of 80 percent of accidents. All contractors make safety a commitment, but it is unique for one to make safety a true passion, and weave it fully into the fabric of their culture. 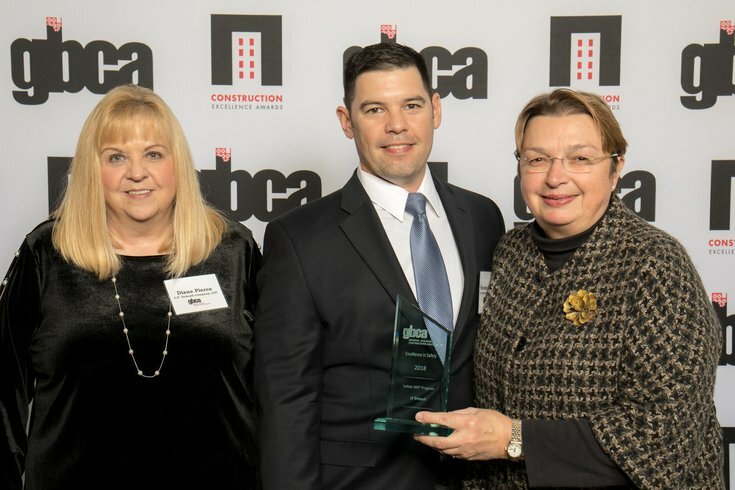 That commitment is why on November 8, 2018, LF Driscoll was recognized at the General Building Contractors Association (GBCA) Construction Excellence Awards with the Excellence in Safety Award. LF Driscoll was singled out for their innovative Safety 360° program. Safety 360° is designed to take project site safety to the next level, and position LF Driscoll project sites for long-term success — so employees never have to worry about returning home safely. Safety 360° achieves a two-part mission: first, to make LF Driscoll the driving force in rising safety standards across the industry, and second, to create a pervasive safety culture that positively impacts everyone who steps foot in a project site. At the core of Safety 360° is a unique, behavior-based approach. Safety 360° is designed to align with what motivates employees, and create a positive, reinforcement based safety culture. The consistent, organizational-wide buy-in to this approach empowers people to reward safe behaviors, consistently coach others on safe behavior, and motivates all employees to contribute to a safe work place. Safety 360° has four key components. True to its name, Awareness expects each employee to be fully aware of their environment, take a 360-degree view of safety, and speak up if anything is amiss. Shared Responsibility gives every employee a role in maintaining safe work sites, include annual coaching. The Behavior component helps avoid risky behaviors altogether, and rewards safe ones. Finally, Positivity ensures safety is preventative and positive, rather than motivated by enforcement. The investment made by LF Driscoll in Safety 360° has been significant. LF Driscoll established a consistent and updated orientation process, materials and safety committee for every project. The company reinvigorated its safety committee, and supported them with a board of external partners to ensure LF Driscoll was engaged with the leading ideas in safety. Safety 360° has been such a resounding success that LF Driscoll’s parent company, Structure Tone, has made plans to roll it out across their entire organization. More importantly, the safety culture that has become further entrenched in the behavior of LF Driscoll employees has already, and will in the future, reduce accidents and injuries. This focus on safety is not new for LF Driscoll. The company’s emphasis has always been not only on reinforcing the importance of safety in the workplace, but uniquely celebrating it as a core component of the company culture. LF Driscoll has been one of the nation’s leading contractors since its founding in 1929. The company’s commitment to safety has been foundational to its success: the company’s ten full-time safety staff oversee initiatives that go beyond expected training, including participation in the OSHA (Occupational Safety and Health Administration) Voluntary Protection Program. VPP is the premier safety recognition program in America: of 8 million worksites nationwide, only 67 qualify for this designation — and three are LF Driscoll worksites. Safety 360° takes this commitment even further, but is a natural growth given the company’s establishing safety as a core pillar of its culture. Their safe project sites have erected some of Philadelphia’s most iconic edifices, including the Barnes Foundation, Citizens Bank Park, the Kimmel Center and Wells Fargo Center. In addition to the Excellence in Safety award, LF Driscoll was further recognized by the GBCA for their work as the contractor on the Axalta Global Innovation Center (Best Residential, Mixed-Use, or Office Space Project), Citizens Bank Park (Best Cultural Institution Project), and Best Healthcare Project (Asplundh Cancer Pavilion at Abington-Jefferson Health).